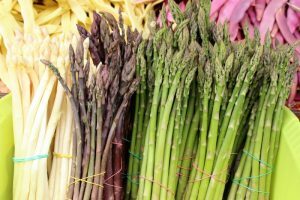 Wonderful Spring Vegetable, easy to prepare and wonderful to eat. Spring is in the air and the markets are full of wonderful Asparagus! Asparagus is versatile and goes well with peas and arborio rice - which is why I created this dish, Asparagus and Pea Risotto. You can also enjoy it in a number of other ways... wonderful grilled and added to salads, blanched and served with poached eggs or just on its own with a pinch of salt and little extra virgin olive oil. used to cook the rice and the other half will be used to finish the dish). •	Bring stock to a simmer in a medium saucepan. •	In another saucepan, heat 2 tablespoons oil + the 1 tablespoon of butter over medium heat. edges are translucent, 2 to 3 minutes. Add wine; cook, stirring, just until evaporated. cook for 2 minutes - risotto is done. additional cheese and lemon zest. Health Benefits of Asparagus 1. It contains glutathione, a potent antioxidant, well known for it’s detoxifying properties; liver and kidney 2. It is rated as an excellent source of fiber, folate, Vit E, B1, B2,K copper and selenium. 3. Is a natural diuretic – a beneficial food for those with high blood pressure and other heart-related conditions. 4. It contains inulin – a prebiotic which helps support the beneficial bacteria in our gut.